Also featured in the “All Bottled Up” exhibit at the Woodman Institute Museum in Dover, N.H., are bottles from another local collector, Dave Landry. They feature amazing colors and designs of his bottles, including figural bitters bottles, mineral water bottles from Saratoga Springs, and a large cobalt blue master ink bottle, among many others. It is not every day that a person can dig old trash out of the ground and have it wind up in a historical museum. So I was thrilled when Tom Hindle, the director of the Woodman Institute Museum in Dover, N.H., contacted me and asked if I would loan the museum some of the antique bottles and glass shards I have dug up from the ground or salvaged while scuba diving over the years. 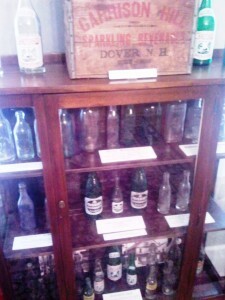 The museum is featuring an exhibit titled “All Bottled Up,” a history of bottles from Dover N.H., as well as period bottles that were found or recovered from the local rivers and lakes. 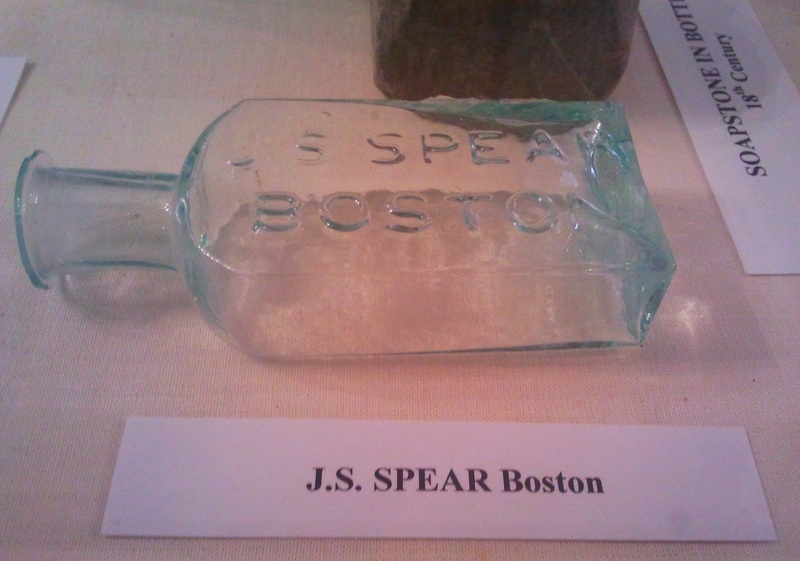 The bottles and shards that I lent to the museum for the year were blown mostly in New England and used and sold by local merchants in Dover. They include several specimens blown at the old Stoddard Glass Works in Stoddard, N.H. The bottles I selected to display in the central case in the museum show a timeline of blown glass bottles, with the earliest dating to the late 18th century, continuing up to the early 20th century, when the advent of bottle-making machines refined the quality and consistency of the bottles as they were manufactured in greater numbers. 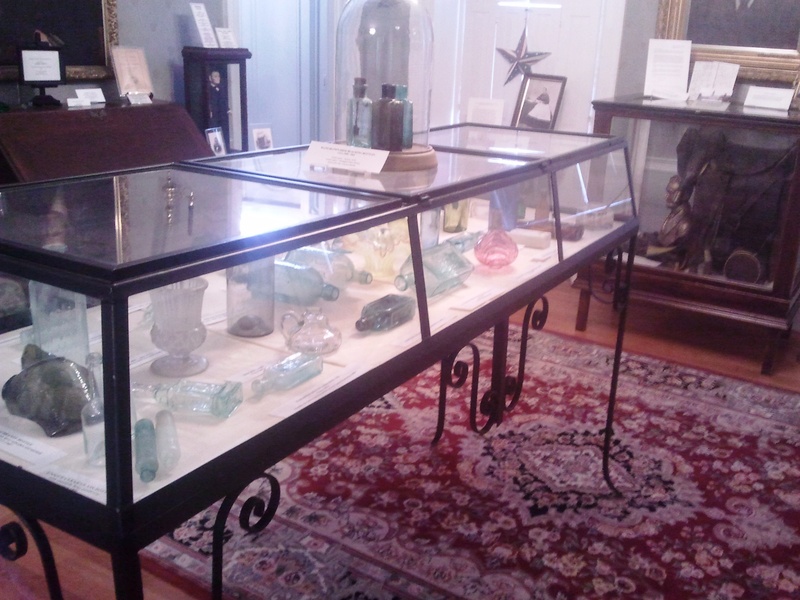 This glass dome is home to three open-pontiled shoe-blacking bottles dating to the mid-1800s in three different colors. The bright green one is what collectors call “Keene green,” as it is attributed to early glass blowers in Keene, N.H. The light blue aqua example is extremely rare because it was recovered from a local river with the original cotton dauber still attached to a metal rod extending from the cork. I remember finding this deep in the silt and didn’t realize the dauber still attached. As I cleaned it back at my home, it was a meticulous task to loosen the cork and then slide the dauber out of the mud-filled bottle without breaking it. Also featured in the exhibit are bottles from another local collector, Dave Landry. 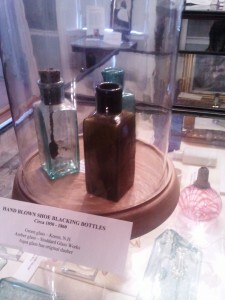 They feature amazing colors and designs of his bottles, including figural bitters bottles, mineral water bottles from Saratoga Springs, and a large cobalt blue master ink bottle, among many others. 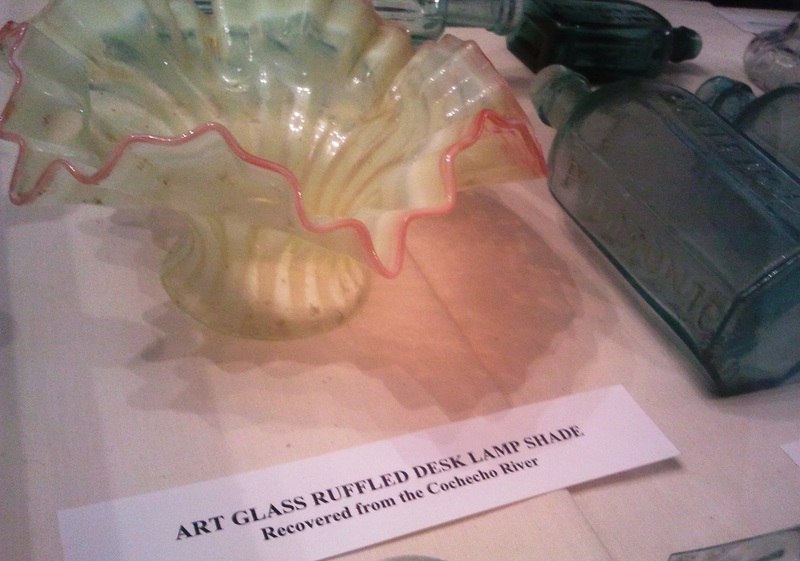 As the museum guests travel from one end of the glass case to the other, it offers a clear, visual example of shards and bottles that were made by hand, one at a time, by glassblowers in small log structures along a mill river in N.H. It ends with machine-made bottles, featuring crisp, clean colors and very few imperfections. When viewed through the eyes of a collector, the appeal of the early, crudely made bottles is well apparent. The glass is filled with impurities, whittle marks and even little grains of sand, with uneven and warped lips. This is a beautiful glass lampshade I recovered from about 15 feet of water. It is delicate, with frilled edges and a cranberry color trim. I spotted it wedged between two moss covered rocks, and couldn’t believe it was whole. After getting it to shore, I found that it didn’t have a chip on it! I dug this bottle 30 years ago and have never seen another like it and is unlisted in any of the voluminous references I have researched. I did find the vendor listed in an old Boston directory, and it showed that he specialized in “Indian medicines.” As far as I can tell, this may be all that remains of his small business venture, dating back more than 150 years. 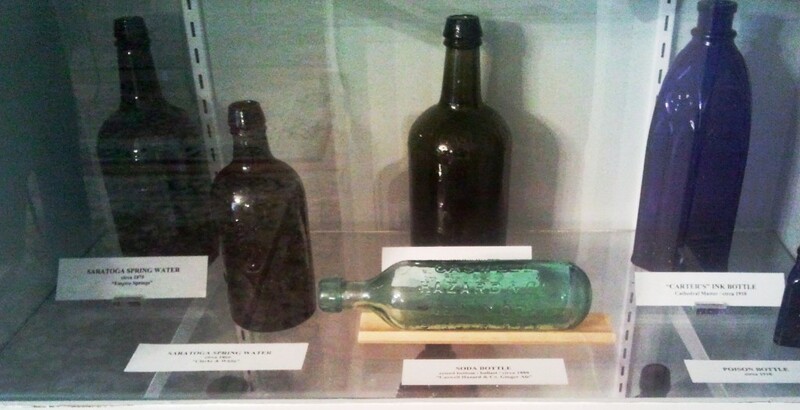 The exhibit also shows the products and potions used by the people who lived in the historical buildings around the town, of which there are many: old ink bottles; bitters and elixirs; cures for diseases of all kinds; as well as whiskey and soda bottles. This is the main display case in the center room on the ground floor. 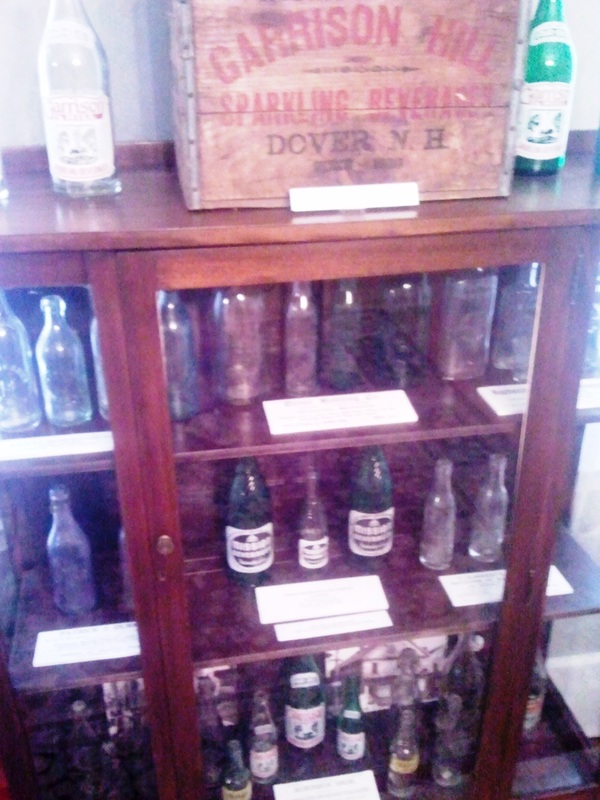 It contains the timeline of bottles, showing examples from 1760 to 1920. A main draw to the Woodman Institute is the last horse saddle ridden by Abraham Lincoln before his assassination. It is in a glass cabinet at the front of the room, along with the original documents detailing the provenance of the saddle. The entire museum is a hidden local treasure. The main building is a three-story brick residence built in 1818. It houses an amazing mineral collection, Indian artifacts, military and animal exhibits, as well as the previously mentioned Lincoln Saddle. It is open 12:30-4:30 p.m. Wednesdays through Sundays, and is located at 182 Central Avenue in Dover, N.H. It is well worth the price of admission, as it offers something of interest to everyone. Bram Hepburn collects 19th-century New England bottles and glass, having spent the last 30 years digging and diving for bottles in New England and upstate New York. He lives in Eliot, Maine. Read My Lips… There’s Treasure in Your Back Yard!